You know what they say – if it ain’t broke, don’t fix it. I suppose that the umbrella itself has been working just fine for so many years already, so why change the design? Trust some folks over in Japan to do so, as the UnBrella Upside Down Umbrella is evidence of that. 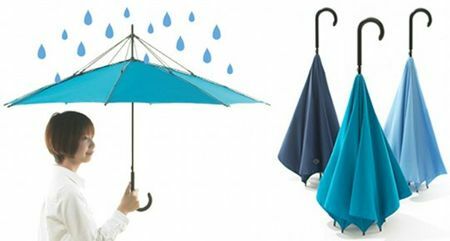 This is a reverse designer umbrella by Hiroshi Kajimoto, and it will cost you a whopping $201 if you decided to bring this bad boy home. One thing’s for sure though, you would be the toast of the proverbial crowd whenever you use this as it pours. It might look extremely unorthodox, but it apparently works like a charm, being able to stand up on its own to boot. You can choose from light blue, navy or turquoise shades.